Photo by David Carson. There's a nice vertical version at his website. This past weekend was the "supermoon," so called—the time at which the moon comes closest to the Earth, and is at its largest and brightest—and the National Geographic collected 11 photographs of it by photojournalists. This shot by David Carson of the St. Louis Post-Dispatch is particularly excellent, although I think Tom Fox's shot is original and all of them are enjoyable to see. I tried to photograph the supermoon too, being a lunatic. (That is, the moon is one of those "trigger subjects" for me—every time I see a nice moon scene I reflexively think it's an opportunity for a photograph. Which is lunacy, of course.) The full moon rising through the trees behind my house is a lovely sight. Unfortunately it's way beyond the DR abilities of any of my digital devices, because there's a steep ridge behind the house and the moon is already high above the horizon by the time it rises into view from here. Those two shots are a whopping 13 stops away from each other, if I counted 'em up right. Way beyond the capacity of the aging Sony A900 to record. The top file has no information in the dark areas—it's pure noise—and the highlights in the file on the bottom are thoroughly blown. HDR is a wonderful tool—I use it all the time—but with this camera, no exposure in between these two extremes has acceptable detail in both the moon and the trees. Even though I want only slight information in the trees, that is, black on dark gray in a B&W print. So what's the solution? Well, the way to photograph this scene would be to do a multi-exposure HDR merge, which is beyond my capability (because in general it's beyond my interests—with photo technique you learn to do what you want to do, and the rest you let go). And the way to shoot very bright subjects in general is to balance the lighting. That is, with the moon, catch it when there's still light in the sky, so the brightness range of the whole subject—called, not surprisingly, the subject brightness range or SBR—is within the range of the sensor or film to record. It's possible, of course, to "shoot* the moon" when the brightness of the moon and the sky are nearly the same (here's an example of that; photo by Becky Anderson). What I ended up doing was driving out to the countryside, stopping on a lonely abandoned road, killing** the car engine and the lights, and just enjoying the sight of the moonlight on the fields and farms and distant hills. The cold night wind in the telephone wires made an eerie hum like a distant keening. Getting back to the original subject: nice work David Carson! **Not murdering or assassinating. I turned it off. Tom Walton: "I admire Mr Carson's editorial discipline. I would want, with every fiber of my being, to nudge that moon ever so slightly to the right. On the other hand, the slight lack of symmetry adds a little tension to the image." MJFerron: "See that photo by David Carson? This is why I did not attempt to shoot the moon. (Nice job David.)" "So rather than fret about not having the proper equipment, think outside the box a bit and before it's too late, get yourself outdoors tonight and take some photos! A little sleep is all you stand to lose.... 8^) "
Geoffrey Heard: "I don't want to mention that I have trouble sleeping at the full moon! Supermoon? Perigee full moon is the term you are actually reaching for—which caused no photographic hysteria back in the day when it was called that before someone labelled a slight increase in visual size (about 7% above normal) 'super.' Here in paradise, where natural phenomena really count, life just went on as normal. Your supermoon did not affect the crops we live on. Or fishing." The "Photography and Procrastination" post the other day was popular and got a lot of attention. I was elaborating on Jay Maisel's idea of "shoot it now." But there's a parallel or complementary idea that goes along with this, and it's this: get out there, and good things will happen. When you get equipped for going out photographing, and go put yourself in one of the situations that tend to make you happy when you've got a camera in your hand, you'll get something. Even if you don't know what it's going to be. You don't necessarily need a plan. Your don't need an idea. Just get out. There's an idea afoot recently that creativity benefits from being treated like work. I have a couple of quotes taped to my computer: "A man may write at any time if he will set himself doggedly to it," which is Dr. Johnson quoted by Boswell; and the characteristically more pithy "Do your work," which is a quote from David Vestal. Sometimes, just slogging along and grinding it out will lead to creativity and positive accomplishment. The only essay that I ever read that was worth a damn as guidance for writers is a thing called "The Getaway Car" in the book This Is the Story of a Happy Marriage by Ann Patchett. In it, she points out that if you want to be a writer, the very first thing you need to be able to do, the essential requirement, is to sit down and write for an hour a day for thirty days straight. If you can't do that, you're not going to get there. No matter how much you study and prepare. These things translate to: get going. Get out there even when you don't feel like it. I had the pleasure of interviewing Ralph Gibson for Camera and Darkroom many years ago, in Manhattan. Ralph might need an introduction to younger photographers, but probably not to older ones. He's a fine (I mean outstanding) art photographer with a distinctive high-contrast B&W 35mm style ("I like a negative that fights back," he told me), so identified with Leica that Leica put out a special-edition camera as a tribute to him. In his darkroom he printed with an old Leitz enlarger that happened to be the very same enlarger on which Robert Frank, a mentor and friend of Ralph's, printed the original repro prints for the book The Americans. Later we went out, and I accompanied him to lunch. Ralph took along a Leica M6 that had a braided leather lanyard as a strap, and only a 90mm Elmarit. As we ate lunch—baskets of steamed vegetables at a café called the NoHo Star—can you tell this visit made an impression on me?—I asked Ralph what he was planning to shoot. Alas, I cannot remember exact quotes; my mind doesn't work that way and I never trained it to, more's the pity. But he said something like, "I've been doing this long enough that I know that whenever I get out and start looking around, I'll get something. I don't know what, but I'll come back with some good pictures." By the way, I made no impression on Ralph. The next time I ran into him, he didn't remember me. Photographing is like that, though. Get out of the house with a camera. Be playful; be open-minded; look around; try stuff. You'll find something. I suppose I ought to add that you still have to be perceptive about what situations work for you. I like to photograph people and animals best—something happening—and I'm happiest doing portraits. I'm always aware that when I just go for a walk and photograph found scenes that it gives me a sort of nagging dissatisfaction. It's because I'm not shooting what I really want to shoot. I'm only shooting what's available to me. To me, lots of photographs of landscapes and streetscapes feel like settings—that is, they're like a stage with no actors on it. I yearn to see people there somehow. I have a friend who feels the opposite. He likes arrangements of objects and static scenes, and the presence of humans "ruins" pictures for him. I'll wait for a person to appear in a shot; he'll wait for the people to leave. We're all different, and respond differently to different shooting opportunities. Nobody will tell you what you respond to and what makes you happy when you're photographing. You have to figure that out for yourself. Get out of the house, yes, but you do have to be smart, too, and put yourself in situations that are amenable to your vision. Target-rich environments, in the jargon of the Gulf War. We can't always do that. But in general the rule holds—the more you get out there, the more likely you are to find good photographs. So get the heck out there! Stan B.: "It really is like fishing, you go out where you hope they're biting with no guarantee whatsoever. And often, you just end up buying a burger on your way home (i.e., you sit yourself down and peruse someone else's work to fill the void of coming home empty-handed). Fate doesn't care how well prepared you are, how well studied, well equipped, or sincere you are—sometimes the moment comes on your way to get a coffee on the corner during break. Did you get it? Or did you think it would happen only when you deemed it to? Sometimes the stars align, everything checks and you get your prize; it's an intermittent gambler's high, the most addictive there is." Ed Kirkpatrick: "I am like your friend; I wait for the scene to revert to its natural state with no human sign. I am uncomfortable photographing people for some reason. I would like to do it more but it just doesn't come naturally to me. Landscapes, those I see by the dozens every day. As I travel around the country in my RV I get a chance to shoot most days. I don't even think about it any more, it just happens. I have learned that the best shots happen when you left your camera home so I always have mine with me. It's true, get out and do it." Mike replies: As a coda to today's post, today I walked my two miles along my lakefront road—it is a wild, blustery Fall day, with roiling clouds and gusting winds and kaleidoscopic shafts of sunlight. Of course I saw an absolutely wonderful picture...created just for a few minutes by the shifting light on the far side of the lake. Not only did I not have a camera with me, but I don't even own a lens of the right focal length (about 135mm-e, I would estimate) to have shot it. Serves me right for not taking my own advice? I stood there and stared for as long as it lasted. Jim Richardson: "Certainly there is much virtue in trusting to serendipity, which is also a kind of deeper faith, that the world has wonders waiting for you if you just go looking for them. (And that you will never know they exist if you don't go.) But there is danger there, too, that you'll be contented to just take whatever comes along, either in the way of the subjects that present themselves or (more perilously) in your willingness to settle for your first impressions. Too many of the stories photographers tell me about their pictures are shaggy-dog tales of lucky moments with a camera or curious twists of photographic fate. "In the end I find myself more drawn to photographers who treat their craft like a great string quartet treats a work by Mozart, going back to it over and over again until the first flush of virtuosity gives way (perhaps after many years) to deep insight. It is not a relaxing way to work; it is fraught with anxiety. I don't recommend it to anyone who want their photography to be relaxing. But if you seek the satisfaction of building a body of work over decades, then I think you have to consider it." James Weekes: "A friend of mine, when he was young, was assigned jobs around the house by his father. One day he complained, as young boys do, about the onerous tasks and how hard they were. His father answered, 'Just do it until you get used to it.' That quote is up in my office and reminds me to go photograph." Struan: "If I go for a walk with the main aim of taking photographs I usually end up reinforcing my worst bad habits. My photographs, especially those more creative, break-a-mental-block photographs, benefit more from an open, empirical bent and an emphasis on the walk itself rather than how it may or may not be a productive investment. Forcing myself to take photographs is the worst way I know of getting out of a photographic rut. Art galleries, books, conversation, or going for a walk without a camera are usually better ways of reminding myself why I take photographs and why it is worth persevering even when things don't look promising." Mike replies: Point taken, but I'm not necessarily advocating just taking a walk. If you have a plan, you still have to work it ("plan your work and work your plan"). Whatever it is you do, whatever your plan is, you still have to get out there and get to it. Your suggestions are good too, but I believe if you're stuck, the best way to oil the gears and unstick the machinery is to go work. Whatever that means for each of us. Stephen Scharf: "While I wholeheartedly agree with the 'Get the heck out' sensibility, I don't agree with not needing a plan. All my best work resulted when I got the heck with a plan." Gary Nylander: "As a daily newspaper photographer, I am often tasked with finding a picture or two for the next day's paper, sometimes for the front page. I call them enterprise photos. I don't have a real plan, but I have found the best pictures come from walking around somewhere, street, park or whatever. With my personal work, sometimes I just get out of the house and get in may car and drive and go and photograph what I can see. Usually I have a place in mind which I often return to time after time, seeing it under different lighting and seasonal conditions." Wesley Liebenberg-Walker: "I have been using (or trying to use) those words—'Get Out There'—as a sort of mantra lately. I apply them to the act of shooting something, but also to the act of being outside, in the real world, rather than inside, on the couch, in the virtual one. It works, mostly. Now if only I could get off the computer...."
"The full context: 'I always thought that inspiration is for amateurs. The rest of us just show up and get to work. You sign onto a process and see where it takes you. You don't have to invent the wheel every day. Today you'll do what you did yesterday and tomorrow you'll do what you did today. Eventually you'll get somewhere. Every great idea I ever had grew out of work itself. If you’re going to wait a around for the clouds to open up and lightning to strike you in the brain you’re not going to make an awful lot of work.'" A brief tip for when the camera is pointed at you: when you're getting your picture taken, stand up (or sit up) just a little straighter than feels natural. Stiffen your spine and square your shoulders. It will feel unnatural to you—you might even feel like it looks conspicuous—but take my word for it, the photograph won't look unnatural to anyone. You'll just look a little better and a little younger. It's true. Try it for yourself and see if I'm not right. Have a nice weekend—see you on Monday. Start-up speed with early digitals caused me to develop a nervous tic that still exists today. My first digital camera was a Canon D60. One of the subjects that I was shooting pretty heavily at the time was high school basketball. While that was not a sports camera by any stretch of the imagination, most of its failings could be worked around. Oddly enough, poor autofocus and high ISO performance were not my biggest gripes with the camera. It was the slow start up and "wake up from sleep" times. When the action was at the opposite end of the court, I'd watch what was happening but wouldn't shoot because I didn't have glass long enough for that. If the action stayed at the far end for any amount of time (free throw situations, etc. ), the camera would go into sleep mode. If a fast break would come back to my side of the court, I'd bring the camera up to eye level only to find that it was busy waking up and I would miss the action. I tried adjusting the sleep settings during games but only found that turning sleep mode off would solve the problem. Invariably, I'd forget to change the sleep setting back and would kill my batteries in no time flat. Eventually, I decided to just give a half press on the shutter while the action was at the far end of the court in an effort to keep the camera awake during the game. This worked except for the fact that to this day, I find myself randomly half pressing shutter buttons (even on my F4S film camera!) to keep cameras "awake." As an aside, the D60 still causes me to smile when I read about today's lower end cameras being incapable of sports shooting. Those who think a rebel or a D3300 are poor sports cameras should pick up an old D60 and try that for a game. Their entry level cameras will seem like a D5/1DX Mk II after that! Chris is a hobbyist photographer based in Pueblo, Colorado. He enjoys photographing the diverse and dramatic landscapes, railroads and grain elevators of his home state. Steve Jacob: "Ah yes, the stay-awake precautionary tick...I use to get around this by deliberately switching the camera off. Knowing I had around 3–4 sec. to wait, I would switch it on in anticipation. This usually meant I was ready just as everything happened...or it didn't happen and I could switch it off. "Upside is that I used to get excellent battery life. Downside was it didn't work well in every situation. However, it worked well enough for motorsport. However I did get very attuned to the sounds of an event. Even now, certain sounds instinctively make me switch my camera on just in case. Of course, now it takes about half a second and it's ready." Stephen Scharf: "Canon at that time was quite good at differentiating its product lines. While one could make do with D60 for sports, Canon's intention was, if you wanted to shoot sports, you needed to transition to the Canon 1D. I made such a transition from a D60 to a (used) 1D in 2003 for shooting pro motorsports, and one of the key performance differences was that the 1D would wake up virtually instantly. 'Responsiveness' has been a key differentiator between pro Canon and consumer or 'prosumer' bodies ever since. I shot briefly with a friend's 5D MkIII, and while it is an excellent general purpose body, I would much rather shoot motorsports with a 1D MKIV (or even my warhorse 1D MkIIN) any day of the week because of the higher level of responsiveness." Lynn: "I, too, learned to half-press the shutter button to wake up the camera. My first digital camera was the excellent (for its time) Nikon Coolpix E4500. Start-up was best measured in geological time. With a young family I soon discovered the need to plan ahead. The best strategy seemed to be to turn the camera on and then make lunch. We don't have many family pictures taken before noon. In the same calendar year. I still have that camera. For macro work it's hard to beat. Its slide copy adapter is very handy too." Gordon Lewis: "The phenomenon you describe is not unique to the Canon EOS D60. I own a Nikon V1 that does the same thing. My intention when I bought it was to use it for street and travel photography. The V1's tendency to go brain-dead without warning renders its utility for spontaneous shots subpar at best. Fortunately I stopped using it well before I developed the costly tic of hurling it against the nearest wall." I was exercising Butters yesterday—he has me trained to do up to four sessions of "fling the ball" every day—when I looked up and, in the crease between two banks of trees, I saw four huge raptors wheeling lazily in the sky. I stood there stupefied, staring, as Butters patiently waited. Despite being very visual in my thinking, I'm bad at taxonomy. I learned in Boy Scouts that I had no aptitude for identifying trees, and despite a love of typography and a fairly sizeable little collection of wonderful books on printing, I have little ability to identify fonts. It's an odd sort of blindness. I'd never make a good birdwatcher. But I think the birds might have been eagles. Later, I caught a brief, several-seconds-long glimpse of one of them from much closer, near treetop level. I didn't get a good look. But it was very large. It might surprise you to learn that many of the "wild" animals you see in "wildlife" photographs actually have pet names. Here, for instance, is a great article about a cougar named Jewel who has a trainer named Logan. Photography Gives a Warped View of Nature"
No doubt thousands or hundreds of thousands of people have seen breathtaking closeups of Jewel's beautiful face under the blissful but mistaken impression that the photograph was taken in the wild and that Jewel is a wild cougar. Photography of oxymoronic captive wildlife is probably hard enough, and photographing real wildlife must be even harder. I never have my camera out with me in the back yard when I'm out there making Butters happy, because "nothing ever happens there." Even if I did have my camera with me, the longest lens I own is a 23mm*. The four birds were all visible for, I don't know, maybe 20 seconds. And if I had a camera around my neck, and if it had the right lens on it, would I have had the skill to set the camera, focus the lens, and photograph those birds in time? If I'm honest, I'm not entirely sure I have the chops at this point. I probably would if wildlife were my passion. But even those guys must do a lot of waiting, and occasionally get taken by surprise. In other words, I have lots of respect for wildlife photographers. I imagine it's very difficult to find real wild animals and make interesting photographs of them. Outside my window as I work are several strands of power and telephone lines at about the height of the second floor. Occasionally, I see a squirrel hop along the lowermost wire, using it, no doubt, as a bridge or a thoroughfare to get from the trees on one side of the house to the trees on the other. I sometimes ponder how hard it would be to get a good shot of him. It's not like I can stand there and wait—I don't see him every day or even every week. I estimate that I'd have maybe eight or nine seconds from the time he first comes into view until he moves past where I sit—at which point I'd be taking pictures of his tail end as he moved away from me. I'm no wildlife photographer, but a squirrel picture from the wrong end sounds even less promising than...well, a squirrel picture. Probably what I'd have to do is to keep a camera with the right lens on it, charged and ready and at the other end of the porch from where I sit. As soon as I see the squirrel, I'd move quickly to the other end of the porch, which would give me a few extra seconds with him coming in the right direction. I'd have to be sure to keep the windowpane clean. Then I'd have to get lucky and see him soon enough...often I'm concentrating too hard on the computer screen. I'd hope to get lucky in terms of the light and the weather in the sky that would be the background. Might take a few tries. ...And then, even if I were successful—and here's my basic problem with wildlife photography, at least when I do it myself—I'd have a picture that dozens of people have already done better. But at least I'd know the subject was actually wild and doesn't have a pet name. I sure wish I had a photograph of those four eagles though—if that's what they were. What an amazing sight, and a privilege just to see. *I know, that's ridiculous. I really should do something about that. Tony McLean: "I've photographed wildlife seriously for the past eight years. It started as a whim but gradually took over my life. I have foresaken the exotic and now spend most of my time at a local reserve a few miles from my home in East Yorkshire. Concentrating on local wildlife has been a wonderful experience. I've seen more sunrises and sunsets than most people experience in a life-time. "I have my own ethics: I don't bait or chase and stay away from those who engage in lists. My advice, for what it's worth, is to forget about cameras and super-tele lenses. Buy a cheap pair of binoculars from a second-hand shop and enjoy the experience. Dawn and dusk are the best times of the day. Just sit, listen, observe and relax. "Photographing wildlife has also helped with my second passion—street photography. Animal behaviour is not so very different from human behaviour." Dave Stewart: "Your wildlife photography has featured here before, 'Ahab—er, Mike.'" Mike replies: Ah, I'd forgotten all about that! Thanks for the reminder. Steve Rosenblum: "In the early to mid-'90's I went through my Nature/Landscape photography phase and schlepped 40 pounds of Canon L glass and tripod around places like Yellowstone in a backpack. I did capture a couple of decent wildlife photos (landscapes were definitely easier) but eventually concluded that I didn't have the knowledge, patience, or physical endurance to really move the needle in that area. My hat is off to those who do. These days, because I still hike and fish in remote, beautiful places, I still encounter magnificent animals and birds along the way. However, instead of focusing my attention on how to get the perfect shot, I focus my attention on being in that moment and really seeing those miraculous creatures with my own eyes (which can capture a remarkable range of colors and contrast) and my brain (which has an amazingly large storage capacity). No special equipment needed for me to 'review' the images either!" Harold: "I shoot wildlife. That is, I shoot red deer in a forest with a two-meter-high fence around it. It's a project, set up in 2005 to re-introduce red deer into the wild in the south of the Netherlands. Politics and such got in the way, and the deer are still behind the fences. Numbers have to be regulated by a hunter. So, they are kept animals like cows or horses. Therefore I can't enter my pictures on many websites about wildlife, or enter wildlife photo contests with rules about captive animals. Pity of course, but such is life." The reason I put up that "Zen of Fishing" post yesterday was because of something Ken Tanaka said—he pointed out that if we were going to talk about "the ones that got away," we should also talk about the pictures we get because of serendipity—essentially, luck. In photography, you miss a lot—you have to—but you also get lucky sometimes, and that makes up for it. In the nice video of the truly great National Geographic photographer William Albert Allard that Joseph Brunjes contributed to the discussion, Bill Allard elaborates on the same theme. He knows what he's talking about, of course, as anyone who is familiar with his work knows. So for this post, I tried to find some pictures of mine that came about by getting lucky—things I just happened to see because I was "out and about" with a camera and happened to come across them. But of course half my boxes are still in the barn from my move at the end of last summer, and I couldn't put my hands on the prints I needed. Don't know what I am going to do about that. But if I can get back on topic, my idea of photographing really is that it's very much like fishing, if you can ignore the ethical and qualitative differences between "catching a prize fish" and "making a great photograph." It's not the metaphor of the end result but the metaphor of the process of getting to the end result that's rich. Photography essentially is serendipity. You put yourself in the middle of your story, in Bill Allard's fine phrase, but even then you really don't know what you're going to find, what pictures you're going to be able to come up with. The question of why some photographs work and other, similar photographs don't work seems simple enough, but only on a superficial level. Go to a deep enough level and it is profoundly a mystery. Well, I've just taken ten times too many words to say what Ken and Bill said much more simply. Yeah, we miss a lot of shots sometimes—but then other times, we get something great that we didn't expect couldn't have foreseen. So it goes both ways. Sorry I can't show you my modest examples. Steve Rosenblum: "'Dans les champs de l'observation le hasard ne favorise que les esprits préparés' —Louis Pasteur. Translation: "In the fields of observation chance favors only the prepared mind." It's easier to be lucky if you are prepared to take advantage of your luck. In my opinion, this is undeniably true in almost every discipline whether it be artistic, scientific, or otherwise." Jeff Buttel: "A friend of mine studied with Harry Callahan in the '60s, and shared this quote with me. 'I'm a very lucky photographer. And the more photographs I take, the luckier I get.'" Bruce Bordner: "I have one 'lucky catch' that perhaps is less impressive without the story. Look first: I'll wait. OK, nice shot, but...? Complex story; sorry. August 2010, Quebec lower city, simultaneous French Heritage and Pirate festivals—a target-rich environment. I was stalking the group of pirates for a while. (Nikon F100, Fuji Velvia 100?, Nikon 18–35mm) The crowd was very dense in the narrow streets, so I could only see heads. The locals were mostly costumed, but we tourists were anti-photogenic.... Suddenly the group of French Ladies appeared from the other direction, and the Pirates went in for a taste. My camera was on my face without thinking... Just as the two groups merged, the crowd parted and click and then it all dissolved and we all went our separate ways. As you've said, one's memories of the event add more to our own appreciation of a shot. To me, this is one of my best images, but perhaps not for artistic reasons." Dennis Dunkerson: "Perhaps because I do both, I am hooked on the fishing analogy. There are several parallels. Some fish to hang their capture on the wall (Artists); some eat their capture (Professional or Starving Artist? ); while others put them back (masses of unseen digital photos). Then there are those that do not really fish that much but prefer to collect thousand dollar rods, lures, fly tying equipment, boats and special fishing clothing. Somehow a good analogy never seems to end." Yonatan K: "One of my favorite pictures was exactly as you (and Ken) describe. I was out for a walk with my son and a camera and we saw a bunch of pigeons behind a local grocery store (I've had a pigeon picture fetish since childhood). 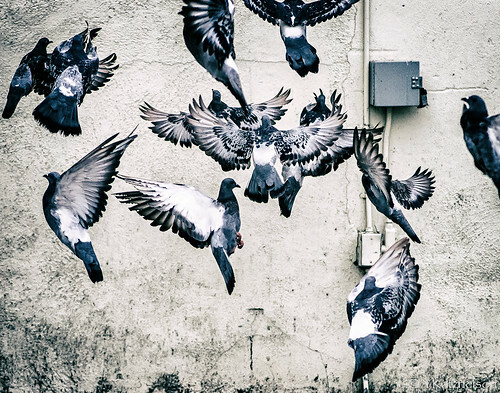 The resulting photograph was a collaboration—my son charged the pigeons and as they took flight, I snapped the photo. I don't know that I would describe it as great in any objective sense, but I like it (in no small part because of the collaborative aspect)." Manuel: "I discovered William Albert Allard about a year ago, and he became one of my favourite photographers instantly. The video you linked to is quite an inspiration, but when I look at some of W. A. Allard's best pictures, I see the outcome of careful preparation and more than a little bit of patience. In particular, Mr Allard has a keen eye for composition, and it's clear he knows how to wait until everything falls into place to form a significant composition. Sometimes you have to wait for that 'decisive moment' to happen. It might take several minutes, or it can occur in an instant; sometimes it happens right in front of your eyes, sometimes you just have to look for it. Either way you have to be properly trained in order to recognize such scenic organization when it happens. I guess this can only come out of experience. It has little to do with luck: even when it looks like a fluke, it really isn't: you were there, and you were ready to see that significant composition forming in your viewfinder. Joseph Brunies' quotation of Seneca says it all." Pay more attention to the light. It's all you ever photograph. That's the whole chapter. Aren't you glad you got me started? Kusandha: "I for one am delighted that you have started :-) "
Mike Lipske: "Please, please, stop teasing us." Steve Jacob: "For chapter 2, how about this one. I recently 'babysat' my best friend's daughter (aged 12) by taking her to a photo-club exhibition while her parents secretly redecorated her bedroom. We were asked to vote for three photos, so I told her to go off and pick her own three independently. Afterwards, we took the printed brochure to Starbucks and compared notes over a large espresso and a caramel latte with whipped cream. Despite a 45-year experience gap, we had both chosen two of the same images. "As a 12-year-old, I have to concede she is quite media savvy, but I was impressed nonetheless. She had clearly given it a lot of thought. So I asked her why she liked one image and not another, even though they were from the same thematic section and were both technically proficient. 'That one,' she pronounced with great authority 'is more interesting to look at!' Further discussion yielded little additional wisdom on either side, but I could not fault her assessment. "So the question is, what makes one image 'interesting' and another 'uninteresting'?" Mike replies: That is a answer I could really sink my teeth into. Whoops, sorry, Mike Lipske! Mark Hobson: "'Light makes photography. Embrace light. Admire it. Love it. But above all, know light. Know it for all you are worth, and you will know the key to photography.' —George Eastman." Please: talk to your students and caution them against the tragically dangerous practice of posing people on active railroad tracks. It's an example of a situation where peoples' natural instincts fail them: what we automatically reason about being on railroad tracks is wrong. Everybody assumes that they'll know exactly where the train is as it approaches; everybody assumes they'll have time to get out of the way. Those assumptions just aren't true. "There’s very little clicketyclack. They can really sneak up on you," said Robert Halstead, president of IronWood Technologies, a firm that reconstructs train accidents. He likened the deceptive speed of trains to those of planes as they’re landing. Even though planes are going 150 mph, "it kind of looks like they’re just hanging there." We've posted several times on this issue, but our reach is meager. Public consciousness of this issue really needs to be raised. It's a safety issue that every photography instructor ought to discuss with his or her students. Darlene Almeda: "I teach 'safety first' always whether train tracks, streets, studio lights, clients tripping over cords and stands, etc., etc. You can never ever stress 'safety first' enough times! So sad for this posting." hugh crawford: "Trains are big, loud, hard to not notice from every direction except when you are straight ahead of one in its path. Then it's kind of quiet, doesn't seem to move much other than getting a little bigger slowly, and that's only if you happen to be looking at it. Otherwise it sort of suddenly just shows up. "It should be noted that in a lot of these stories there is not just one person who fails to notice the train, but several. Three in this case. You would think that a person paying really close attention and looking for a train would see one coming, but that just means that the train coming from the other direction is going to be a real surprise." Alex: "My spouse, a civil engineer, had to work on a bridge that crossed over some railroad tracks, and her entire work crew had to go take the basic safety training provided by the railroad to their own employees. The one thing that stood out was this little fact: if a Norfolk & Southern employee is found sitting on a railroad track, he or she is fired on the spot." wts: "Welded rail (no clickety-clack), silent electric engines or almost silent modern diesel-electric engines, modern wheel bearings, almost no vibration, etc. produce efficiency needed by modern railoads. That's why the loudest sounds from the Boston MBTA D-line trains behind my house are the air-conditioning units on the roof. Every school should teach the dangers and specifically the quietness, speed deception, and the dangers not just of being on the tracks but even near the tracks (for example, steel straps on flatcars may come loose and strike anything within 10 feet of the tracks). Yes, there are noisy exceptions, like wheels with flat spots that do make click-clack sounds, but these are truly the exceptions that eventually will get maintenance." TC: "It's frightening that, even after reading this story, there are still comments claiming that you have to be uncommonly stupid to be hit by a train. This, in my opinion, is exactly the kind of thinking that ends up in people, thinking of course that they personally are not uncommonly stupid, to do these kinds of things. Just stay away. Thanks for the reminder, Mike; I plan to make this point to my students tomorrow." I’ve been practicing street photography for the past forty years, and have done it with practically every brand and type of camera there is. I’ve used rangefinders, SLRs, DSLRs, 35mm, medium-format, and pocket cameras. Some have had interchangable lens mounts, others have had fixed lenses. I’ve even used large format and Polaroid, although not for street photography. I can therefore state with assurance that, if you’re motivated enough, you can use practically any type of camera for street photography, as long as it’s quick and easy to operate and does not require a tripod. The quick and easy to operate part is essential. If you’re a street shooter, one second can literally mean the difference between capturing the perfect moment or missing it entirely. Street shooters therefore look for a camera that’s ready in an instant, with no startup lag or delay. Once the camera is ready to shoot, any perceptible shutter lag is a deal-breaker. The autofocus (assuming your camera has it) has to be just as responsive and, better yet, accurate. Easy-to-operate is a bit more subjective. I define it as a camera that, rather than insisting you use it on its own terms, seems able to read your mind and follow your will. A commonly used term to describe this quality is “transparent.” The opposite is a camera so obstinate it makes you want to hurl it against a brick wall and spit on the shattered remnants. It certainly helps to have a camera with reliable autoexposure and white balance, as well as enough dynamic range to handle high-contrast lighting without blowing out the highlights or turning shadows solid black. If you’re shooting raw, however, these qualities are secondary and can be adjusted after the fact. Low noise at high ISOs is another minor concern when you’re shooting outdoors in decent light. In low light a touch of “grain” adds character. As simple and obvious as these requirements might seem, cameras that have them all are not easy to find. For example, some cameras are slow to power up and be ready to shoot. Others add to this delay by also being slow to wake up from battery-conserving “sleep mode,” or requiring the lens to also power-up. There’s also the issue of battery life. Given that all digital cameras and even some film cameras are completely battery-dependent, you have to make sure you have a fully-charged battery or two on hand while you’re out shooting, otherwise you run the risk of holding a paperweight instead of a camera. There are, of course, cameras that will shoot for several days on a full battery charge, but these tend to be larger cameras that have correspondingly larger batteries. Most street shooters prefer small cameras: They attract less attention and are more comfortable to carry for long periods of time. Exercise Caution: This was shot recently with my old faithful Nikon FM3A with 50mm ƒ/1.8 AI Nikkor, loaded with Kodak Gold 400. It's an examle of the benefits of minimal automation: Because I focused manually and by eye, I knew the camera couldn’t try to refocus as soon as the bicyclist in the foreground appeared in the frame. One thing to be vigilant for is how often the supposedly sophisticated AF systems in some cameras can misfocus, even when aimed at static or slow-moving subjects. I’ve owned a Nikon D7000 with 39 AF points and micro-focus adjustment and a Canon EOS 60D with 9 AF points and no micro-focus adjustment. Both have focused so inconsistently that I’ve either had to send them in for repair or get rid of them. DSLRs with optical viewfinders offer almost no pre-exposure confirmation of whether the image is in focus or not. The image can look sharp through the optical viewfinder yet be out of focus when you review it. My limited experience with mirrorless cameras is that they focus more reliably, but not always as quickly, especially in low light. In the past, you could circumvent such AF issues by pre-setting focus manually. Today, few lenses that still have a usable focusing scale, index, and depth-of-field markings that the only other available option is prayer. My current favorite cameras for street photography are the Olympus OM-D E-M1 with 25mm ƒ/1.8 Zuiko, which I have rented but don’t own, and my Nikon FM3A with 50mm ƒ/1.8 AI Nikkor. Both meet almost all of the criteria I’ve listed, although in different ways. I could be missing something though. If you’re a dedicated street photographer and have found the perfect camera for your needs, I’d love to hear about it; that is, unless it’s bulky, heavy, laughably expensive, and notoriously difficult to use, in which case you should probably keep it to yourself. CORRECTION: "OM-10" should have been "OM-D E-M1." Sorry for the error. —Ed. Gordon Lewis's excellent new book on street photography has just begun shipping. Here's the U.K. link . A funny thing about last Sunday's coffee post: although it drew comments from lots of committed and dedicated coffee enthusiasts who are deeply into their morning brew, actually it wasn't meant to be that type of post. Actually it was meant for people who aren't coffee fanatics. It was meant to be basic advice for people who are casual about coffee, but who just wish their morning cup tasted a bit better. (That was the situation in which I found myself when I "got into" coffee in the first place.) That is, it was meant to describe the simplest, most cost-effective way to get the most improvement most easily. What follows is similar advice with regard to improving your photography. Similarly, this is not directed at those of you who are professionals or experts, or who get to use your cameras all day, or who are naturally gifted with complex technology of all sorts—you, I'm sure, could teach me a thing or two. (The real problem with enthusiast sites is that they're composed of experts talking to each other rather than to typical and average real people.) Rather, this is basic advice for casual beginners or intermittent intermediate photographers...that is, most of the people out there, and probably a majority of those who actually read this site. It's this: Learn your camera, and practice with it. It's the most effective, quickest, easiest way for the most people to improve their photography. Or at least their enjoyment of their photography. This is why it's best to pick one camera and stick with it...because that makes it more likely that you'll really get to grips with it and master its ins and outs...and eventually get comfortable with it. Your camera should be an old shoe. Assuming you're not an expert or a pro or particularly gifted with technology, it's better to know one camera intimately, even if that camera isn't perfect, than it is to have many cameras that, taken selectively and altogether, can handle any situation. So first, you need to learn your camera. This can be done with the manual, or with a book about your camera, or by reading Internet reviews and feature lists and working through the menus and concepts. ...And this is work. Make no mistake. It's hard. It's hard for me, and I'm supposed to do it for a living. The less you know about the basics of photography, the harder it's going to be, too. Secondly, practice with your camera. What does this mean? First, work out your holding technique. Figure out how to stand when you shoot and how to hold the camera for horizontals and verticals and when using the viewing screen. Where do your hands go? Where are your elbows? You should do this the same way every time. If you get the camera out for five minutes a day to practice with it, which you can do in your office or at home, this is the first thing to run through—all your holds. Gradually these become second nature. Five minutes a day is fine. If you do it most every day. Note that I'm not going to tell you how to hold your camera, or link to a site that does that. It's your camera, and you know yourself...so you work it out. Try different things. See what you think is most stable, most comfortable. See where your hands need to go in order to reach the most often used controls on your particular camera. Then, during your five-minute practice sessions, give yourself various tasks and simply run through them. Set ƒ/8. Change to auto-bracketing and back. Change from autofocus to manual focus and back. Set a specific ISO then change back to auto ISO. Pick a subject in your living room, raise your camera, focus and set it, and take a picture with a vertical hold. Lamps in the living room are helpful. How do you meter with a lamp in the center of a frame, vs. at the corner of the frame? Do it. Shoot it. What works best? The things you practice could be different depending on your specific camera. For instance, on my newish X-T1 I use both high-speed continuous and autobracketing fairly regularly; I never use either on menu-driven or IBIS cameras. So now I practice how to get to those settings. It's easy, but that brings up another good point: practice even things you already know how to do. Just do it. The repetition is what helps. Eventually, you'll develop a mental list of your go-to controls and you'll become familiar with the physical motions you need to go through to actually set them on your camera. What you're aiming for is comfort and facility—familiarity—with your camera. If you practice, then every time you get to shoot reinforces your practice, as well as your practicing paying off with greater fluidity and fluency when doing real shooting. No need to be a nut about practicing. Five minutes does it. It's the regular, consistent repetition that does the trick. And note that five minutes a day five times a week is much better than 25 minutes once a week. That's all. Learning your camera and practicing with it is the easiest, simplest, most effective thing you can do to improve your photography. It's basic, yes, but it's also important—and the less you use your camera, the more important it is. Jim Bullard (partial comment): "That's good advice for anyone, Mike. Back in the days when I was teaching classes of beginning photography, the first assignment I gave my students was to sit down with their camera and its manual and learn what every button, knob and dial did. I told them they might not, perhaps even probably wouldn't, use all the available controls for the sort of photography they wanted to do, but they should be not using them because they chose not to rather than because they didn't know what the control did. That was in film days and the 'features' on cameras were significantly less extensive than they are today but I believe the advice still applies." Jerry: "It seems that this advice would be extremely useful for a variety of activities including writing, drawing and fly fishing. Great thoughts." Tadeo (partial comment): "This reminded me of...a wonderful quote from Bruce Lee: 'I do not fear a man who has practised a hundred kicks, but I fear the man who has practised one kick a thousand times.'" Derek responds to Tadeo: "I believe the quote from Bruce Lee is, 'I fear not the man who has practiced 10,000 kicks once, but I fear the man who has practiced one kick 10,000 times.' Same general idea, but amplified quite a bit. To underscore this a bit further, standard training sets in Jeet Kun Do (the system Bruce Lee developed, and Dan Inosanto significantly extended) are 1,000 repetitions of a technique. These leave you...tired, and generally sore. :-) They also take quite a while!" c.d.embrey: "This applies to everything, not just photography. Sorta like driving on a slick road, If you have to think about it you'll crash. Things need to be second nature, if you are going to be successful at anything." Pak-Ming Wan: "The moment the penny dropped for me on this subject was when I watched videos of pros using my camera. Watching their fluidity and effortless action I thought, 'Gee, I need to work on that.'" Having been stung by accusations that I didn't know what I was talking about when I wrote about cellphonography recently (accusations which were, however, true), I have dutifully been making an effort to shoot more, and more seriously, with my state-of-the-art* iPhone 4s. I took this one messing around as I waited for my spring rolls to appear at the local Asian Fusion tonight. One version of the future is that ILCs (interchangeable lens cameras) as they are now known will have virtually disappeared in 12 or 15 years, as computational photography synergizes with Moore's Law to create smartphones that take nearly infinitely croppable pictures made sharper by camera shake and which allow you to choose exposure and point of focus after the fact. I have to say I think it's possible. The market for smartphones is so vast, far greater than anything photography has known in the past—development is sure to be swift and deep once things get going. But if it's true, then my State-of-the-Art* iPhone 4s (last one announced before the death of the great Jobs, R.I.P. and He Will Be Missed) is roughly equivalent, in digital/smartphone terms, to what a Kodak Brownie camera was in the 1940s. What I mean is, it's pretty primitive compared to the postulated future. I think I'll stick with my antidiluvian and soon-to-be-antiquated ILCs anyway. But at least I've had a little experience with iPhonography now, and know how to open the camera without typing the passcode and how to add a snap to a text. As my good self gets dragged, not kicking and screaming, but nodding and smiling, into the twenty-teens. Stephen Gilbert: "David Hume Kennerly, one-time White House photographer, has been using the iPhone for a while. He's pretty good at it. :-) "
Mike replies: Yeah, well, to paraphrase the old Chevy Chase joke on the original Saturday Night Live, he's David Hume Kennerly, and I'm not. Incidentally, I recognized DHK in a park in D.C. once when I was a student (he lived nearby), and he (generously) stopped to talk to me. In the course of our conversation I asked him what camera he used, and he replied, "It doesn't matter! It doesn't matter!" So there's that. Ranjit Grover: "I like the equation between the cellphone camera and brownie camera. But, I loved shooting with that brownie at that time. I learned the ABC of photography with that. Brownie was the very first camera I had. Cellphone camera will be the very last camera I will have." Jerome: "This is a very promising development. In my opinion, the camera manufacturers are stuck in filmthink. Cameras work as before, and are designed around an imaginary film canister and takeup spool. Canikon have replaced film with a sensor, and left it at that. Reminds me of early automobiles, that were horse carriages without horses. "Fortunately, innovation is coming from outsiders, who don't see digital just as a substitute for film, but are ready to explore the new possibilities that it brings. Nokia with its pureview technology, lytro, smartphones and apps—and of course Sony. They will keep pushing, create new interfaces and ways to capture images. Not restricted by a status quo of the late 90s of the past century. "It might well be that a 7D mark VII will be the best horseless carriage ever, but not very relevant." Jordi P.: "Digital native here. The usefulness of cameraphones might be seen much more if you encounter situations when the main camera isn't there. It's great for my time at college, even at classes. On the streets, where people don't pay you attention with the phone. "I'd say it is the modern day box brownie + Polaroid + mail turned instant. Good light camera, decent in shade and bright interiors, forgetaboutit in lower light; as a snapshooter would with slowish film. Instant mail: once my phone grabs a wireless network (at college) in no time it's 'beaming' to my headquarters all the files, which I can get from my dropbox account anywhere. Jesus, I am 20 and couldn't have imagined it a few years ago! And I was quite a tech-savvy kid. "Ten years from now? Don't know. My S4 with 1/3" 13MP module kills my two compacts from 2004 and 2007, except flash. I'd love a Lumia 1020 if it had Android on it. Computational photography applications + a small increment in sensor efficiency and size would do a lot of good in the short/midterm (IQ wise). "iOS and Android in the latest iterations will support RAW as DNG. I played with a DNG from a Nexus 5 and it was veeery nice!"